The Bangle of the Sun Version X (晴のバングル バージョンエクス, Hare no Banguru Bājon Ikusu ) is combination of the Sun Original Vongola Ring, Penalty, and the Vongola Box Ring, Kangaryuu. It was made by Talbot. This bangle, as revealed by Talbot, is a Vongola Gear, the Vongola Gears being made exclusively for the 10 Generation Vongola Boss & Guardians. 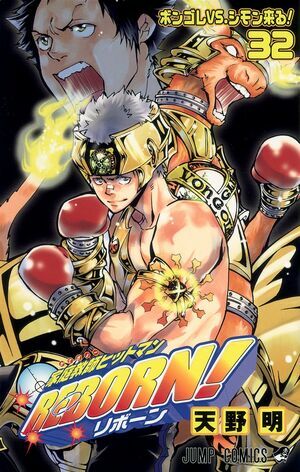 It took the form of a bangle to best suit Ryohei's fighting style. According to Ryohei, since it was made to best suit his fighting style, his Cambio Forma no longer has the three-minute time limit. When Ryohei activates his Cambio Forma, his bangle turns into a round piece of metal with 10 pieces of metal sticking out of it. Each time the user takes damage, the bangle turns that amount of damage into Sun Flames, and lights a Flame on one of the metal pieces. Every 10% of damage lights one flame. When the user has taken 100% of damage the whole bangle ignites. This Flame can be released without any preparation time. Ryohei calls this release his "Maximum Sunshine Counter." The Bangle's method of turning the damage taken to the user's body into Dying Will Flame is a symbol of the Vongola Sun Guardian's role, which is: "Destroying the misfortune that attacks the Famiglia with their own body, they become the Sun that brightly shines upon an area."